3 cups carrots, grated. I used 7 carrots. Depending on size. Preheat oven to 350 degrees F. Spray and flour bundt pan. Get eggs, neufchatel cheese and butter or margarine, out of fridge. Grate carrots and put aside. In a bowl sift flour, baking soda, salt and cinnamon together. In another bowl beat sugar and eggs together until lemony color. Cook in preheated oven for 50-60 minutes turning pan around after 30 minutes. Check at earliest time. It is done when toothpick inserted comes out clean. Let sit for 5 minutes and turn out on cooling rack. Cream neufchatel cheese and margarine until smooth. Beat in sugar and vanilla until incorporated. Ice cake, if desired, when cool. Sprinkle with nuts. 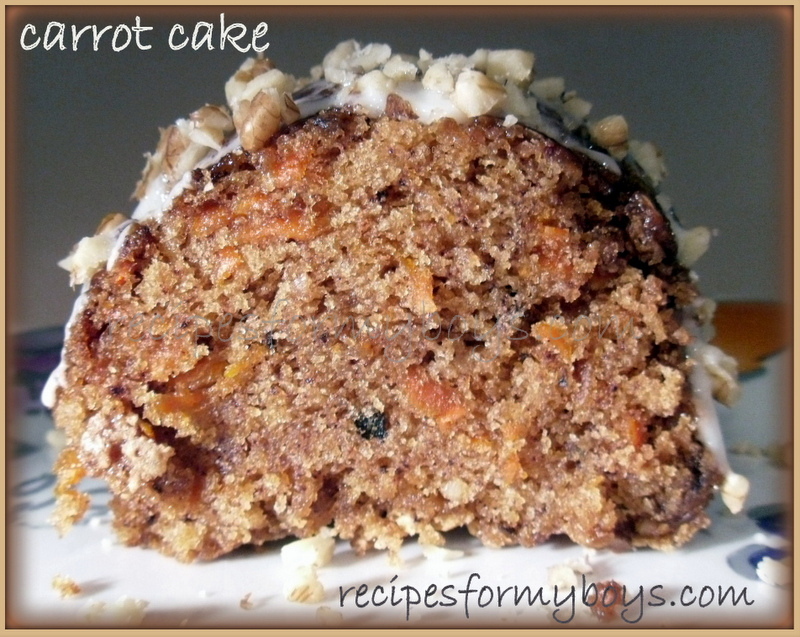 Debi, I love carrot cake but haven't had it in ages. I'm the only fan in this house so I have to rely on the kindness of friends to share when they make one. This just sounds so good, I may have to make it just for me then send the leftovers off with hubby for his coworkers.